This security poster illustrates the POMZ-2M Russian anti-personnel mine. The ‘M’ designation refers to the modern version of the POMZ-2, allowing for a fuze to be screwed into the main body. This trip wire activated mine is mounted onto a wooden stake with main charge fitted into the mine body, allowing the body to fragment above ground level. 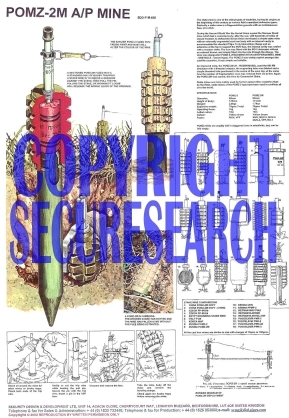 This security poster features the technical specifications of the POMZ-2M anti-personnel mine, illustrations and descriptions on how to disarm the POMZ-2M anti-personnel mine, Russian diagram of POMZ-2M deployment, a sectioned POMZ-2M fuzed MUV-3, the earlier POMZ-2M fuzed MUV, stake mine comparisons, and a POMZ-2M in Cambodia. A sectioned POMZ-2M fuzed MUV-3. The earlier POMZ-2M fuzed MUV. Russian diagram of POMZ-2M deployment. Illustrations and descriptions on how to disarm the POMZ-2M anti-personnel mine. The technical specifications of the POMZ-2M anti-personnel mine. This security poster features the technical specifications of the mine, illustrations and descriptions on how to disarm the mine, Russian diagram of POMZ-2M deployment, a sectioned POMZ-2M, the earlier POMZ-2M, stake mine comparisons, and a POMZ-2M in Cambodia.